The trade deadline has come and gone. Now I'll write about it. The Braves picked up left-handed pitcher Paul Maholm and outfielder Reed Johnson from the Cubs and in turn, gave up two minor league pitching prospects, including Arodys Vizcaino. I'm happy. Frank Wren isn't giving up the future for the present. The Braves didn't give up Julio Teheran, Randall Delgado, Sean Gilmartin or any of the other prized prospects that other teams have been eyeballing. I hate to lose Vizcaino, but the Braves had to give up someone. If he and Jaye Chapman are the extent of it, I'm good. Paul Maholm is 9-6 this year with a 3.74 ERA, 1.20 in his last six starts. He's having a strong season, giving up less than two earned runs in 12 of his last 21 starts. He'll provide another veteran presence on the pitching staff. 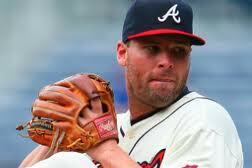 He's a southern boy who grew up a Braves fans and his style and demeanor very much fit the Braves mold. Twice last year, the Braves made a strong push to get Reed Johnson from Chicago but the Cubs weren't ready to give him up. Johnson is a great utility player who gives Fredi Gonzalez the opportunity to give much needed, late-season rest to Michael Bourn, Martin Prado and Jason Heyward. He's a sorely needed right-handed bat off the bench. He's hitting .302 this season, .448 as a pinch hitter. Ben Sheets has three stellar starts under his belt. With the addition of Maholm, the Braves can move tonight's starter, Kris Medlen, back to the bullpen. He's pitched brilliantly in that role and that's where the team needs him most. In hindsight, perhaps Ryan Dempster's lack of desire to play in Atlanta was a blessing in disguise. No shock that the Phillies were big sellers. You have to pay for that pitching staff somehow. The under-achieving Marlins are once again regrouping. The Mets were quiet and the Nationals held firm. The west coast got much stronger. The Angels, Dodgers and Giants were buying all the big ticket items that the Brewers, Cubs and Phillies were selling. This is all setting up for a very interesting post season, not the same post season that was predicted in the spring. Buckle up folks! All streaks come to an end. Hitting streaks. Winning streaks. And of course, losing streaks. Let's face it, the Braves couldn't lose every Monday game until the end of eternity. Still, this one went on awhile. Longer than I ever thought it would. The thirteenth Monday game of the year and finally a win. Was it the high socks? Was it Chipper on the twitta? No, it was just time for the Braves to win on a Monday. Truth be told, the Braves were actually 0-for-16 on Mondays. Yes, this losing streak started last season. It dates back to August 22nd. Almost a year. You could probably look for a reason as to why this one went on so long. You won't find one, no matter how hard you look. There's only one explanation. It's just how baseball is. As for the socks, every player and coach wore 'em high, except for Tommy Hanson. He's either not very superstitious or he's just that confident. It's gotta be the confidence. After all, every baseball player is superstitious! I did the unthinkable. I swore I would never, ever do it. Not in a million years. Not this girl. Nope. Not me. What caused this break in my resolve? What made me weak? Anyone who knows me, knows that I'm tough. I stand my ground. If I say "no Twitter" then there is no Twitter for me. What powerful force could cause me to change my mind? You know what it was. I know you do. Anyone who can cause his manager a sleepless night with one simple tweet has me...hook, line and sinker. Don't expect any tweeting from me. I just want to keep up with a few folks and stay entertained. No tweets. Yeah, just like I said I'd never join Twitter. We'll see how long this lasts. Oh, and btw, Peter Moylan has amazing insight on the Olympic games. It's totally intentional that I haven't written about any of the rumors, the speculation, the upside or the potential fallout of any trades that did or didn't or haven't yet happened as the deadline approaches. There's so much going on behind the scenes, bits of information slip out too early and then the "done deal" isn't. So, I'll just sit back and wait. I'm glad the Braves have moved on from waiting for Ryan Dempster to make his decision. Nothing worse than being the bridesmaid and not the bride. If his heart isn't in it, it will show on the mound. Speaking of heart being in it, I am loving what Ben Sheets has done so far. I don't want to jinx anything, but he's pitching lights-out ball and fitting in perfectly in the club house. Paul Janish, who I didn't know jack about, has been a great pick up. I love his defensive skills and he's saved many a run from scoring. I don't know what will happen after Andrelton Simmons and Jack Wilson are both back, but I'm thinking that Jack may be the odd man out. I've been so impressed by the way Mike Minor has stepped it up since the loss of Brandon Beachy. Last night the Braves pitching staff retired 16 Phillies in order. That's what we want to see! In the meantime, Miguel Batista has been picked up, likely as a long reliever. Jair Jurrjens will head to the bullpen which will put Kris Medlen back in a starting role. A bit of a merry-go-round that could change in a millisecond. As for me, all I want to see for certain, is Michael Bourn in a Braves uni next season and Martin Prado signed to a long term deal. I know Frank Wren doesn't have a money tree, but that's what I'd like to see. As I noted in my previous post, last night Chipper Jones became baseball's all-time RBI leader for third basemen. He's in stellar company! Chipper's thoughts on this milestone? "Everybody wants to be number one in some category. In most categories, I'm number two or three. It's nice to be number one in one. Obviously, passing Schmidt and Brett is pretty elite company. I'm honored." Braves shortstop Paul Janish knocked in the game winning RBI last night. On May 20, 2010, when the Braves overcame a seven run deficit in the 9th to beat Cincinnati, Paul Janish was the Reds shortstop. Last night's moment wasn't lost on the newest Brave. The Braves two catchers have hit home runs in 8 of the last 11 games. Brian McCann has hit eight and David Ross has hit two. David has a nine game hitting streak, dating back to June 17th. Not too shabby for a back-up catcher! ...last night was the Thrilla in D.C.!! Anyone who gave up, anyone who didn't stay up 'til the end of the game, y'all truly missed a game for the ages. This was the win that the Braves needed. This was the win they needed against the team they needed to beat. It was a beauty!! Being down 9-0 in the 5th versus the Nationals with Stephen Strasburg on the hill, rain on the way and sleepy bats in the dugout doesn't give any Braves fan a warm and fuzzy feeling. But the team didn't give up. They slowly chipped away and everyone contributed to the extra innings win. How hard is it to come back from a nine run deficit? The last time the Braves did it was against the Padres on June 7, 1987. Need a point of reference? Chipper Jones had just finished his freshman year of high school that year. The Braves scored four runs in the 6th, but the 8th inning was pivotal. That's when they came within striking distance. The top of the 9th put them on top, albeit briefly. The bottom of the 9th brought disbelief. The top of the 11th welcomed an unlikely hero. The bottom of that inning brought elation! Lots of emotions, lots of heroes. It was a game where everyone truly contributed. Every starting position player got a hit, they just needed a few innings to warm up. When the pitchers faltered, the bats picked them up. And the unlikely hero who got the game winning RBI? The newest Brave, Paul Jannish. The player the Braves picked up for his defensive skills, not his bat. Irony. And then there's Chipper. 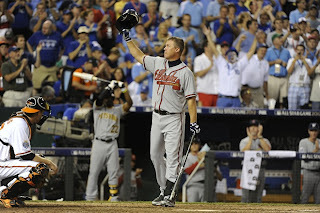 In the Braves biggest comeback win in over 25 years, the Braves third baseman made history. With his 2-out, bases loaded single in the 8th, Chipper drove in two runs. Those two RBI's gave him 1,598 for his career, surpassing George Brett (1,596) as baseball's all-time RBI leader for 3rd basemen. For me, the most telling part of that moment, was that it was so very inauspicious. The ball was taken out of the game and tossed to the authenticator in the Braves dugout. Chipper didn't even crack a smile. He had his game face on. The Braves were within two and that was all that mattered to him. Yes, there were quick hugs from Jason Heyward and Freddie Freeman as they took the field at the bottom of the inning and a nice conversation with Nationals third base coach Bo Porter before play resumed. But it was very obvious, there was only one thing on Chipper's mind. A win. A win that the Braves got. There's no time to rest. Two games are on tap for today, one for tomorrow. 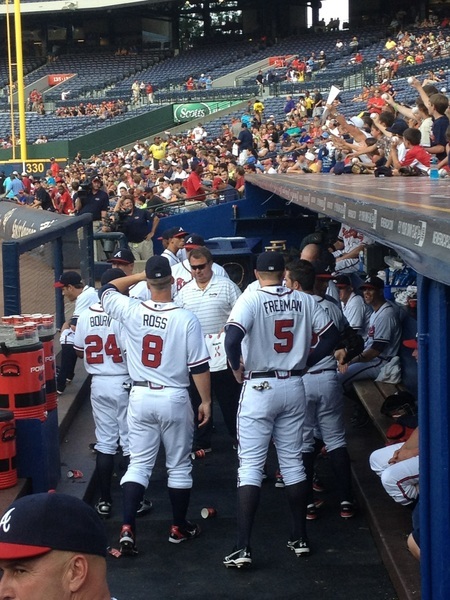 Let's keep momentum in the Braves dugout! For what reason(s) should a pitcher intentionally hit a batter? In response to his rather bizarre antics from last night's contest, I think there were many expecting to see Tim Hudson plunk Melky Cabrera during this afternoon's Giants/Braves game at Turner Field. Why? In Tuesday night's game, Cabrera made some very inappropriate and offensive gestures to the fans sitting in the left field stands. In last night's game, Cabrera had an unusually slow trot around the bases after his 6th inning home run. In the bottom of that same inning, as Jason Heyward reached second base, Cabrera taunted Jason, as if to "dare" him to attempt to make it to third. And at the end of the game, after Gregor Blanco's 11th inning home run, Cabrera's celebration was one that any baseball fan or player would consider excessive. In today's game, after hitting a triple in the 8th inning, Cabrera made a chopping motion as he stood on base. Individually, any of the actions would be brushed aside. But the sum total of all raised quite a few eyebrows, both inside and outside the Braves dugout. Here is my question. Where is all this vitriol coming from? Is Melky mad at the Braves because they chose not to keep him after the 2010 season? Let's face it, throughout his career, Melky Cabrera has consistently under-achieved. He had never even come close to living up to his potential. That's why the Yankees let him go. That's why the Braves kept him for only one season. That's why the Royals kept him for only one season. Cabrera was upfront in saying that last off season he rededicated himself to the game. He dropped 20 pounds and got himself into better playing shape. His long-overdue effort has resulted in what is becoming his best season ever, including being named the All-Star Game's MVP. And that my friends, leads me back to my original question. At some point during Thursday's game, should Tim Hudson have put Melky Cabrera in his place? 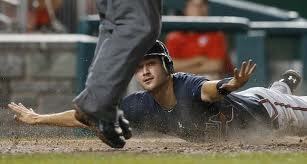 Should Huddy have given him a reminder, just under the chin, about how the game is suppose to be played? And honestly, would anyone in the Giants locker room have cared? I'll admit it. I was waiting for it. The Braves and Giants will meet again August. Be sure to tune in. It's hard to believe we've already hit the midway point of the 2012 season. Here's what we've seen so far, by the numbers. 26 - Most saves at the All-Star break. 16 1/2 - Most games out of first place at the break. 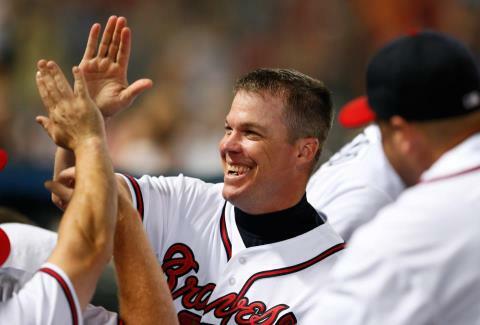 8 - Number of All-Star appearances for Chipper Jones. 5 - Number of 40 year old players (or older) with a hit in an All-Star Game. 4 - Number of Atlanta Braves in the All-Star Game. 4 - Number of positions the Braves Martin Prado has played this season. 3 - Number of No-Hitters thrown this season. 2 - Number of Perfect Games thrown this season. 1 - Number of teams without a No-Hitter. 1/2 - Number of years the Houston Astros have left in the National League. Nationals would be leading their respective divisions at the All-Star break. As I've said before, one of my favorite things about baseball is the tradition. The respect that the players have for the game and for the players who have come before them. And this was so very apparent throughout this year's All-Star Game. Chipper Jones was the star of the show, the unofficial mayor of Kansas City and the unofficial MVP of the game. He's not the first player to be treated royally at his final All-Star Game. It happened with Cal. It happened with Tony. It will happen with Derek. As a die-hard Braves fan, I loved seeing Chipper being appreciated and honored by players and fans alike. I loved watching Bryce Harper plant himself next to Chipper on the rail of the NL dugout, soaking up every bit of a once-in-a-lifetime opportunity. Just as Chipper was in awe of Ozzie Smith and Cal Ripken Jr. at his first All-Star game, the tables have turned and he is the player that the youngsters want to emulate. I loved watching interviews with the next wave of potential superstars, Mike Trout, Stephen Strasburg and Bryce Harper all wanting to talk to, sit with and learn from players like Chipper and Derek Jeter. In yet another classy move, Tony LaRussa asked Chipper to address the NL squad before the game. Chipper said he was surprised and very honored that LaRussa asked. He even joked that he felt bad for his NL teammates as the AL team received a pre-game speech from Hall of Famer George Brett. I don't think anyone in the NL locker room was complaining. The Kansas City fans were just as appreciative of Chipper. From the crowd response he drew during the All-Star parade, to the cheers he received during the team introductions, to the way the crowd (and players) saluted him as their cheers and applause rained down upon him during his only plate appearance, it was a wonderful tribute to a man who has always honored the game by playing it right. For me, it's been fun watching Chipper have fun this season. He's still playing at an unbelievable level, making unimaginable plays exactly when the team needs them. He's still clutch. You can tell when he's not happy about something. Just look at those eyes and the way his jaw is set. But he's smiling and laughing more than ever before. He's learned to take a step back and appreciate every little thing in his last season. One more lesson he learned from Bobby Cox. In 1990 the Kansas City Royals had the highest payroll in baseball. Really!?! It was a valiant effort Braves fans but sadly, when the last votes were tallied, Michael Bourn came in second in the All-Star Game's Final Vote. That said, during the last 48 hours of voting, Michael went from fourth place to second. And if you want to be technical about it, Michael really went from fifth place to second, as Chipper was leading in votes until he was named Matt Kemp's replacement. What does all this mean? It means that Braves fans are not as lame as the national media would have the rest of the country believe. I searched and searched but I couldn't find the actual number of votes cast for each player. But I did learn something very interesting. Michael Bourn had more votes via Twitter than any other candidate in either league. This was the first year that MLB utilized Twitter as a means of voting. Tweets averaged more than 2,500 per minute and peaked with 8,881 in the final minute. There's always a slight chance that another spot on the roster could open up. I would hate for any player to have to bow out of an All-Star Game, but if that should happen, the National League definitely needs another outfielder. With Chipper and David Freese being added, the NL now has four 3rd basemen on their roster. And they're short one outfielder with the loss of Matt Kemp. If another player is added, my fingers are crossed for Michael. There was a great, sad irony in Braves Country yesterday. On the day we lost beloved actor Andy Griffith, the Braves game started with a rain delay. Any long-time Braves fan will always associate Andy Griffith with the Atlanta Braves. 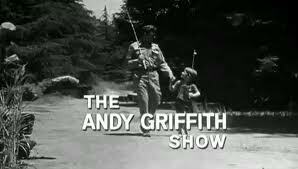 Way back when we watched the games on Channel 17 on the UHF dial, and later on TBS, rain delays were always filled with re-runs of "The Andy Griffith Show". In my mind, Andy Griffith and rain delays go hand in hand. We all felt like we knew Andy Griffith. If you grew up in the south, undoubtedly you knew someone like Sheriff Taylor, a sweet southern gentleman with a deep insight on life. Someone always ready to teach you a gentle life lesson. We all lost a dear friend yesterday and I feel like I lost a part of my childhood. One thing is for certain, Sheriff Taylor and everyone in Mayberry were Braves fans. I'm sure that Andy Taylor took his son Opie to his first game at old Atlanta Stadium. Aunt Bea packed them a lunch for the long ride down and Opie fell asleep on the ride back home. Floyd the barber always had the game on the radio in his shop as did Gomer and Goober at the fillin station. You know I have to be right. After all, Mayberry was right in the heart of Braves Country. All season long, Chipper Jones has described Michael Bourn as the Braves most vaulable player. A player who deserves to represent Atlanta in this year's All-Star Game. But Braves fans have been torn in the All-Star Game's Final Vote. Do we vote in Chipper one final time, rewarding him for an unparalleled career? Or do we vote for Michael, the clutch player who has been a human highlight film for the team all season long? Luckily for Braves fans, the dilemma ended yesterday with Chipper being added to the NL roster as a replacement for injured Dodger outfielder, Matt Kemp. "The one reason I'm really glad it happened today is because now we can all vote for Mike Bourn and get him there," Chipper said. "Mike Bourn has been our most valuable player this year. He has jump-started our offense time and time again. When he came over to shake my hand to congratulate me, I told him he was coming with. ... So we've got to get him there." OK, Braves fans. You heard what the man said. Let's get Michael Bourn to the All-Star Game. Voting ends on July 5th at 4pm and you can vote as many times as you want. At last count, Michael was in last place. So vote early and vote often! This was not the post that I originally intended to write. Yesterday afternoon my plan was to remind everyone to vote for Chipper Jones in the All-Star Game's Final Vote. It was going to be a very inspiring post! One that would rally my followers to vote and get our third baseman into his final All-Star game. But that all changed in an instant at the start of last night's game when the breaking news was announced. Tony LaRussa had added Chipper to the National League roster! And Chipper responded in kind, showing us why he is an All-Star for the ages!! At Sunday afternoon's game (yes, I sat through 9 innings in 105 degree temps) I was very disappointed to see that Chipper hadn't been named as a reserve on the NL squad. I was thrilled for both Dan Uggla and Craig Kimbrell, two very deserving Braves players, but I thought that LaRussa would reward Chipper based on his career. But, with Pablo Sandoval being voted in (?) by the fans, there was no way that LaRussa couldn't name David Wright as the reserve. In hindsight, I think that LaRussa was waiting for the injured Matt Kemp to officially give up his spot. And that spot, LaRussa was saving for Chipper. Anyone who watched the number retirement ceremony for LaRussa and heard the comments that the former Cardinals skipper made about Chipper knows the respect that he has for the Braves third baseman. LaRussa was going to have Chipper on his team no matter what. - Chipper went 5-for-5 for the third time in his career. It was the first time he did it in front of a home town crowd. And he utilized the entire outfield, spraying hits from foul pole to foul pole. - Chipper extended his hitting streak to 10 games. He is only the second player in Braves history to have a streak that long at the age of 40 or older. He now sits in the company of Rabbit Maranville, who did the same in 1933 as a Boston Brave. - Chipper stole his first base of the season, the 150th of his career. - Chipper made an incredible catch-twist-throw-to-first fielding play in the top of the eighth, reminding us that he still has it in the field too. After his 5th hit in the bottom of the 8th, Chipper was replaced by a pinch runner. Braves fans let their feeling shine through! As he walked to the dugout , Chipper tipped his cap to the crowd's thunderous ovation. After hugs and congratulations from his teammates, Chipper gave the fans a curtain call. In interviews before and after the game, Chipper's excitement about the trip to Kansas City, the one major league city he's never played in, shone through. He spoke of the honor of being chosen and his excitement on sharing the experience with his sons. In fact, that is what he is most looking forward to. "I'm going to be a kid in a candy store carrying four other kids in a candy store." As for his thoughts on the game, there were two quotes that stood out to me. "It was one of those dream games. I'd be hard pressed to find another game where I played better." "Every time something cool happens, I cherish it." So do we Chipper. So do we. Photo courtesy of the Atlanta Braves site.